Kefir is a cultured milk beverage. It’s similar to yogurt but the taste is a bit different and it’s more of a drink than something you’d eat out of a bowl. Unlike yogurt, kefir contains beneficial yeast as well as good bacteria. If you can tolerate dairy, kefir is a great probiotic food to incorporate into your diet. Kefir is also incredibly easy to make. If you haven’t made kefir before you’ll first need to acquire some milk kefir grains. The least expensive option is to try to get extra grains from someone who’s already making kefir. I suggest asking members of your local WAPF chapter. Healthy kefir grains usually multiply so people who regularly make kefir often have extra grains to share with others. If you can’t find any free grains locally you can also order grains online. I highly recommend this online source for quality kefir grains. Once you have your grains the kefiring process is quite simple, although it may take you a bit of time to get used to it. Please feel free to ask any questions you might have in the comments. I’m not exactly a kefir expert but I’ve been making kefir long enough that I’ve figured out what works best for me. Put your kefir grains into a clean glass jar. How much milk and kefir grains you want to use is up to you – flavor and texture change depending on your ratio of grains to milk. I typically use 2 to 3 tablespoons of grains for about 2 to 2 1/2 cups of milk. Cover with a cloth or something breathable to keep fruit flies and other objects out of your jar. Secure the cloth with a rubber band. Leave the jar out at room temperature for about 24 hours. If it’s particularly cold in your kitchen, you may want to keep the jar in the warmest spot you can find. Kefir grains like warmth. Check the kefir after 24 hours. It should be thickened and starting to separate into curds and whey. If you don’t think it’s done, leave it out for another 12 to 24 hours until it appears finished. My kefir is always done after the first 24 hours, but yours could take longer if your kitchen is particularly cold. When your kefir is finished, stir it up in the jar so it’s liquid again, then pour it into a strainer to strain. I use a small plastic strainer set inside a canning funnel over a glass jar. If your strainer is small like mine you’ll have to pour the kefir into the strainer in batches. Gently stir the kefir to encourage it to move through the strainer. When you’re finished, all your finished kefir will be in the jar while your grains will be left in the strainer. Store your finished kefir in the fridge. If you want to further reduce the lactose content of your kefir, you can instead store the finished kefir on the counter for a day before transferring to the fridge. Many kefir resources caution against using metal in any stage of the kefir making process. Dom (an online kefir expert), however, argues that this advice originated before the popularity of stainless steel utensils and is thus outdated. When I started making kefir I purchased a special plastic strainer and only used non-metal utensils. Given what I’ve read, however, I would not be concerned about using metal on my kefir grains. 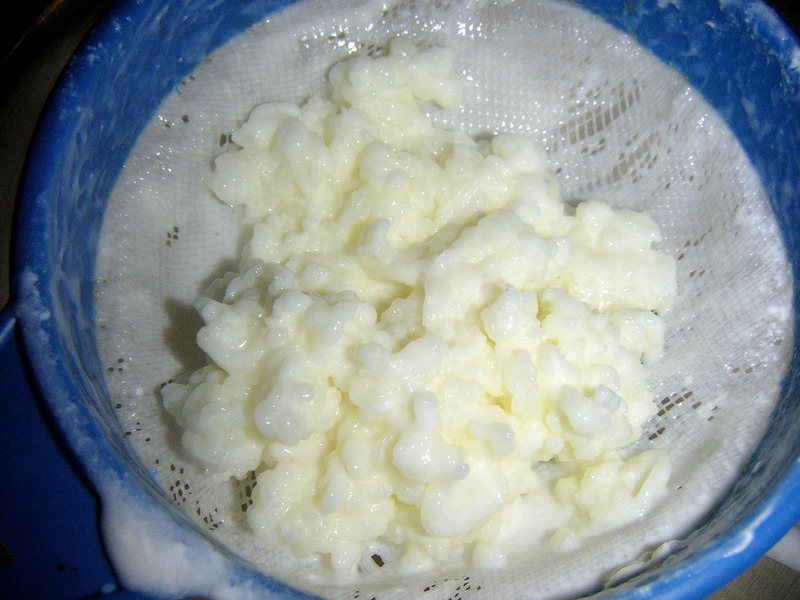 Kefir grains often multiply quickly. If you find yourself with extra grains, give them away to friends, eat them as extra probiotics, or just throw them away in your trash or compost. If you need to take a break from making kefir, put your kefir grains into a jar with fresh milk as usual then store in the fridge. Dom recommends storing kefir grains for no longer than a week before providing them with fresh milk. If you only want to drink a small amount of kefir every day, I recommend making a small batch every day rather than making a large batch and then storing the grains in the fridge. Kefir grains thrive best when they are allowed to spend most of their time culturing on the counter.